Splitting Adam live at The Roxy, April 1, 2009. Shot with a Canon EOS A2E on Arista Premium 400 film pushed to 1600. 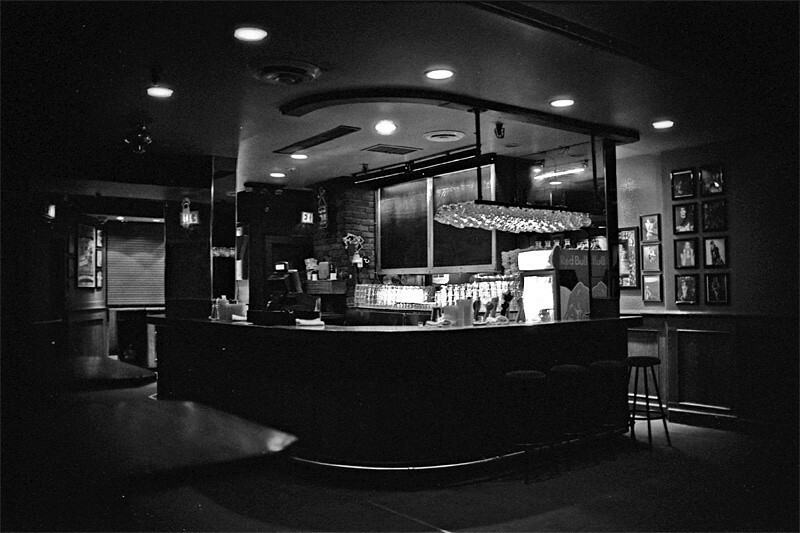 Developed with HC-110 for 16 minutes. I tried using a Sigma 30mm f/1.4 for some of the photos. It's a lens intended for crop sensor DSLRs, so it has a smaller image circle than a regular full-frame 35mm lens. It works fine for cameras like the Canon 40D, but on full-frame and 35mm SLRs it vignettes on the corners of the frame. In some ways that's bad but in some ways it's good. The other shots were done with the good old cheap, plastic Canon 50mm f/1.8 lens.